This volume presents the written Word of God in a highly readable, accurate translation, excellent for personal and group study. Extensive study notes, topical essays and word studies provide fresh and faithful insights informed by time-tested, authentically Catholic interpretations from the Fathers of the Church and other scholars. Commentaries include the best insights of ancient, medieval and modern scholarship, and follow the Church’s guidelines for biblical interpretation. Plus, each New Testament book is outlined and introduced with an essay covering questions of authorship, date of composition, intended audience and general themes. The Ignatius Study Bible also includes handy reference materials such as a doctrinal index, a concise concordance, a helpful cross-reference system, and various maps and charts. Like many of you, I am very excited about this publication and hope that the complete, OT and NT, version will be out in the near future as well. It is really nice to see that they are including a concise concordance in this edition, and presumably in the complete edition whenever it is published. Although I don't always feel it is necessary, I do think a concise concordance can be a very handy feature, particularly if you lead Bible studies. The doctrinal index should also be helpful as well. The last time I saw one of those was in an old St. Joseph's NAB that I own. Overall, it looks promising. I wonder if they will include the study questions that are found in the back of the single volume editions? Also, I wonder if there this edition will be published in different covers? While I wouldn't necessarily expect any premium leather editions, it would be nice to see it in some of the high quality synthetic/Duo-Tone/Premium Ultra-Soft covers. 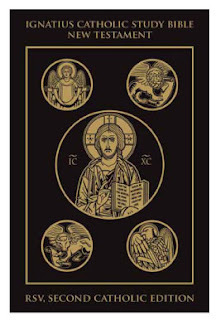 I also think they should develop a specific website for this study Bible, which would serve not only to promote the Ignatius Catholic Study Bible, but also to be a place to find additional study helps including an online version of the RSV-2CE. Wouldn't that be nice? You can pre-order the paperback edition here. revisions, etc. Plus, some new essays. Doctrinal index, concise concordance, other study helps, including new full-color maps. OT books slated to begin pub in Fall 2010. We'll see how much faster the OT books will come out--certainly faster than NT. All of this is very good to hear. I like that there will be some additional essays, and new full-color maps. It is also encouraging that they plan to produce the OT books at a quicker pace. Excellent! I hope they at least offer it in a hardback cover. I will use this for reference only (since it does not have the O.T. or Psalms and continue to use my regular RSV-2CE for prayerful and general reading. Then one day when Ignatius offers a full study Bible, that will become my regular Bible. Yeah I agree with you as usual. I will probably end up using it as a reference book until the one volume edition is published. I certainly have high hopes for it....whenever it is fully published. Here here, gents! We need a full study Bible out of this project. Hopefully it won't take until 2020. Yeah, that really jumped out at me as well. That could make this study bible even more handy, perhaps replace my old New Oxford Annotated RSV. Yeah, I decided to pre-order this, it looks like it is only going to come out in paperback (at least initially). It will come in handy for Bible study. Any word at all about when they will have the whole bible? Some of us, can't afford to buy a new bible every year. I have not found any date for the completion of the whole Ignatius Catholic Study Bible. They have said that the Old Testament parts will come out faster than the New Testament ones. So, perhaps 2015? Thanks Timothy, Another 5 years...wow, It just seems to take so long for the Church to come out with a good study bible. I know I could buy the books put out for each book by Scott Hahn, but that is a lot of money if you add them all together, besides I really would like to have a good study bible, then I could buy the books when I could afford them, when I was studying a particular book. Really seems like the Protestants have it over us when you compare, they have all sorts of Study bibles. Yeah, it just seems like we don't have the ability to put stuff out quicker than our Protestant brothers and sisters. Things are a lot better, don't get me wrong, but I think if there were a larger publishing house behind this project, it would get done quicker.